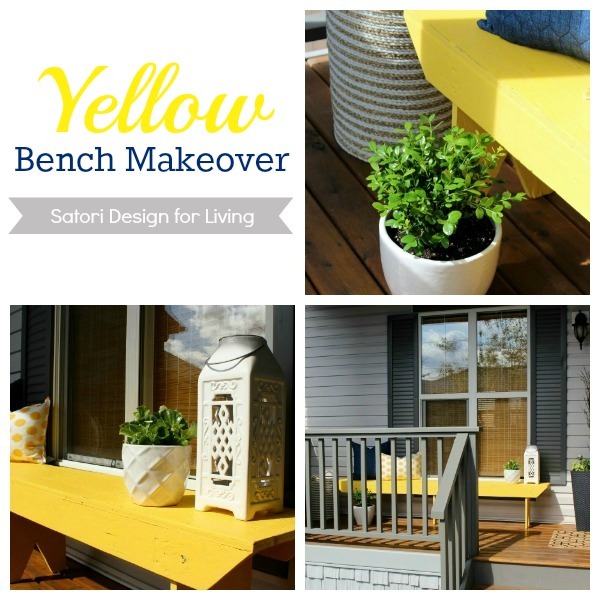 See how a salvaged yellow bench added some much-needed personality to our front porch after a quick paint job and some simple styling. Perhaps it was the dreadfully long winter or the result of looking at a bazillion cottage inspiration pics, but I knew I had to add yellow somewhere around our house. I’m not talking about the washed out version either, rather something bright and cheery! Sounds a bit scary for someone who loves neutrals, right? 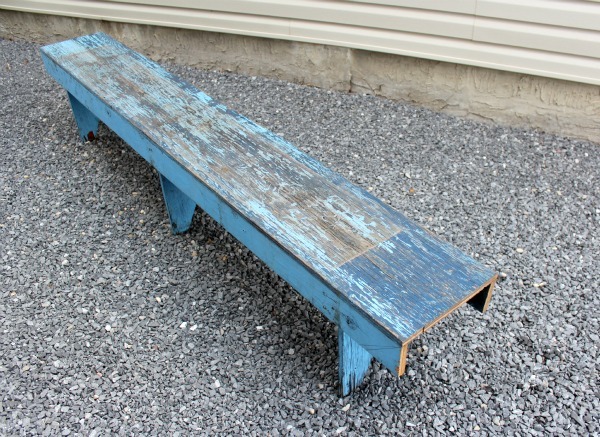 But when I was looking at making over the rustic blue bench I discovered at my parents’ farm last summer, I knew it was the perfect opportunity. It would be that unexpected pop of colour at the front door that made me (and hopefully others) smile every time I entered. A safer bet than committing to something that vibrantly coloured inside. Some of you pleaded with me on Satori’s Facebook Page to leave the bench as it was. I did adore the look of the top, but the rest was a hideous blue colour I just couldn’t live with. As well, I wanted it to be a functional bench that we could use for summer backyard parties. Somehow flaking paint and large splinters weren’t exactly what I had in mind. In addition, we had to cut the ends of the bench in order for it to fit into the back of the truck. That meant I had to address the newly exposed wood. Convinced yet? To start the bench makeover, we cut the angles back in the ends with a jigsaw. Then, I removed the flaking paint with a wire brush and sanded down the rough and splintery parts until everything was fairly smooth. For the base coat, I used Behr’s exterior paint/primer custom mixed in Golden Honey by Benjamin Moore. 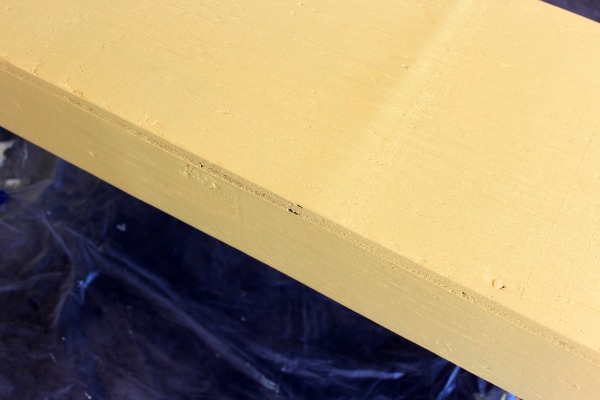 Once it was dry, I gave it a light sanding and followed up with another coat of paint in a deeper yellow colour I created by mixing the Golden Honey with a very vibrant yellow colour called Macaw by Behr. I sanded once again and lightly brushed on another paint mix with a bit more of the Macaw yellow to achieve the brighter hue I wanted. The photos don’t show it well, but it gave the yellow some depth and variation by building the layers. The final step was sanding the entire bench to expose some of the original blue colour and give it an overall smooth finish. After changing our front door colour last fall and freshening up the porch, I wanted to add some additional decor pieces, including seating, but ran out of time before the cold weather hit. 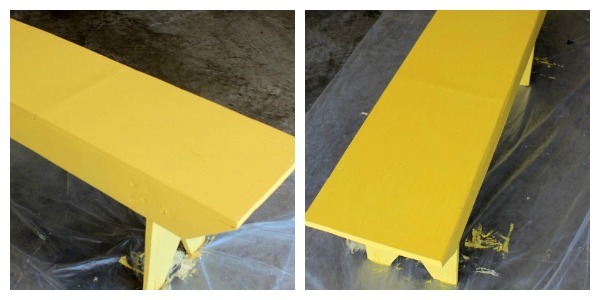 My “new” yellow bench was the perfect foundational piece to finally start the decorating process. On one side, I created a seating area with pillows for enjoying that mid-afternoon iced tea and reading break. Simple potted plants were added to bring in a touch of green and the crispness of white. Simple white plants make me happy! An Indonesian basket, lantern, and a graphic door mat were the final decor pieces added to give the front porch some personality. The whole combination is the eclectic look I was hoping for. Do you think I chose the right colour for the bench? Too bold or just right? Have you stepped out of your box and painted something a bold colour lately? 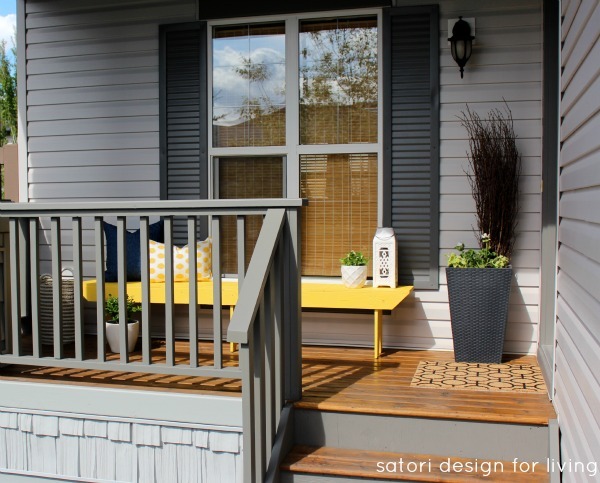 Is there anything unexpected you’ve done to make your front porch welcoming? 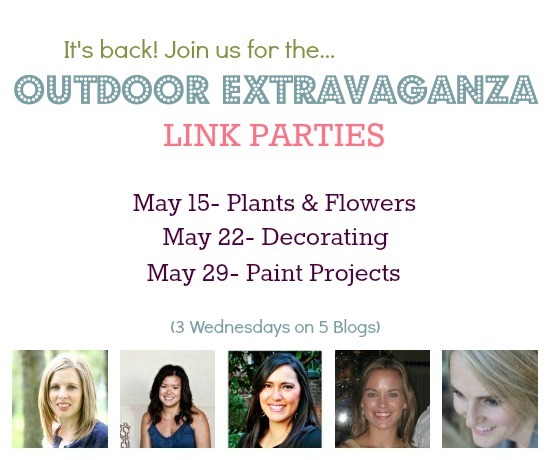 Be sure to come back tomorrow for the Outdoor Paint Projects link party. It’s the final week of the Outdoor Extravaganza, and we’d love to see you there! I love this bench and makeover! I think the color looks great and it brings life to your entryway! Love it…. I think it looks really cute! I like the little bits of blue poking through the yellow. love it! 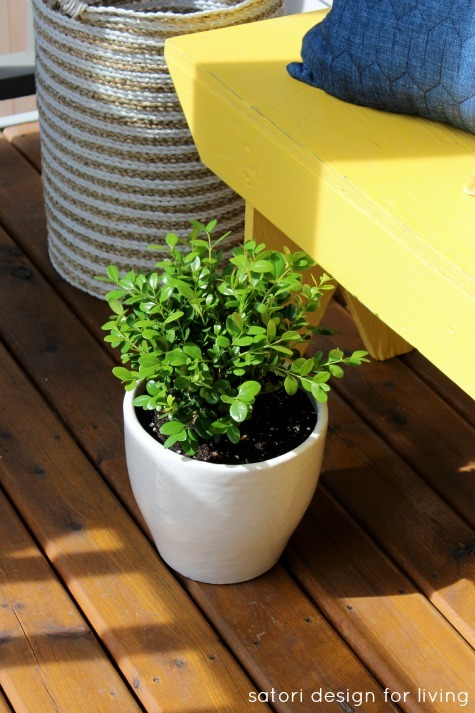 the color is so cheerful on your porch! I have had a love affair with yellow for awhile and it’s exactly the color I would of chosen as well Shauna! Looks great against your house! So cheerful! I love it! If it had been purely decorative, I would’ve tried to replicate the look on the sides. Now we can at least sit on it and move it to the back yard for parties. Thanks for stopping by! what a fun cheery color! 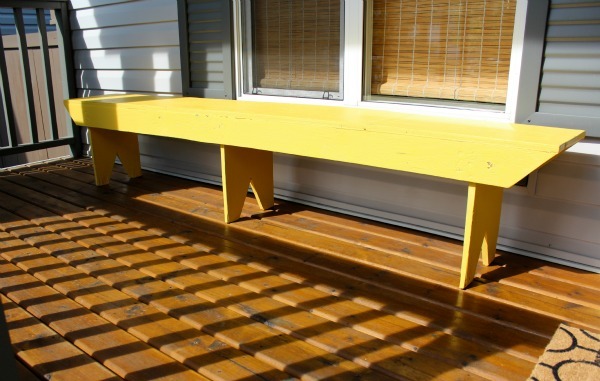 Love the pop of color the bench adds to your porch! Looks great! 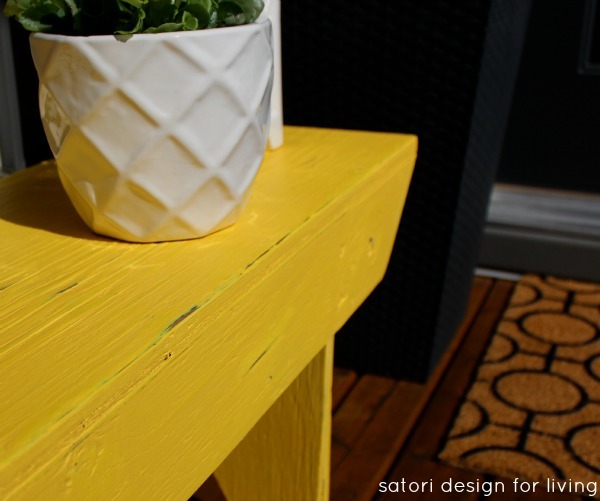 This is a fantastic pop of yellow and so cheery for summer! Love the accessories too! 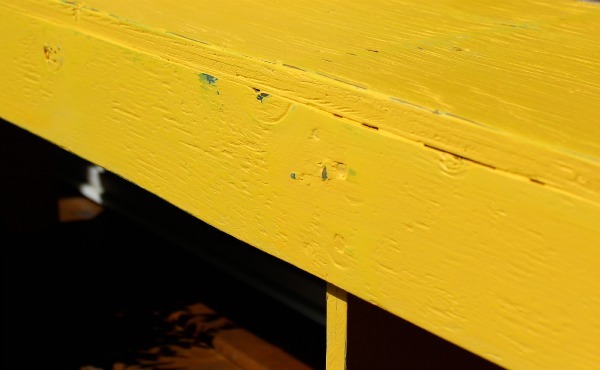 I have an old bench and I am suddenly getting the urge to paint it a bright color. Thanks for the inspiration! You should. Don’t be timid either. I thought I may go with a softer yellow, but it needed the punch for sure! 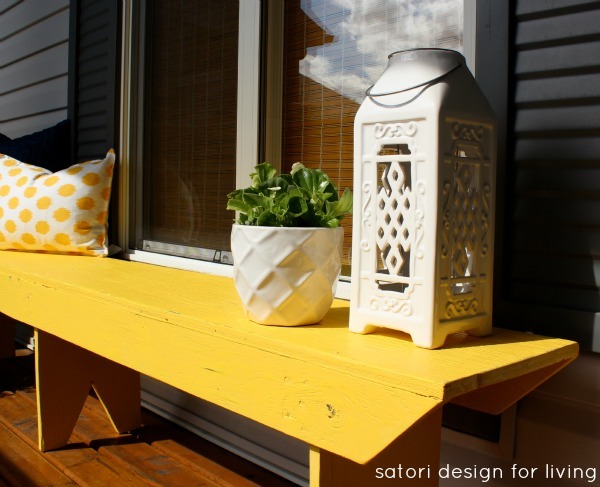 Such a bright new spot on your porch now! Beautiful makeover. 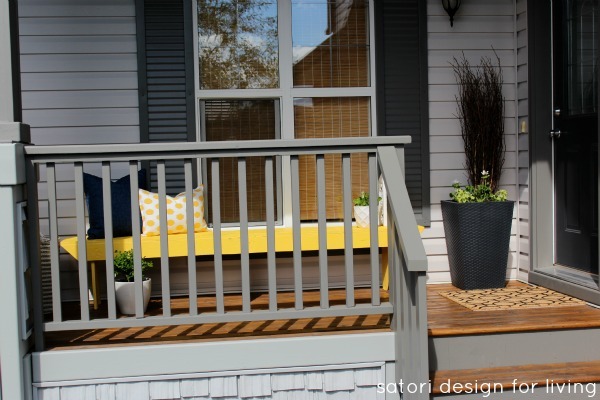 perfect and slim seating area for your porch. love it! I love the bench! And the colour you chose is awesome, perfect little punch & very nice impact! Nice udpate! It was a cute bench before, but I wouldn’t have sat on it! Lol. 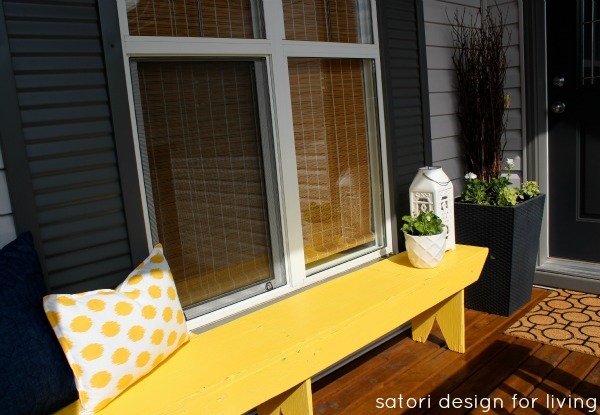 The yellow give the whole porch such a punch of colour. Turned out really well. I love this! The yellow is so fresh and pretty and looks amazing with all your dark blue and white. Love the bench – what a great colour! Adds so much personality to your front porch. Now I feel like painting something yellow! Nice job, your porch is beautiful! Love that yellow. I’ve been painting everything yellow lately too. Must be summer!! Thank you for the inspiration. I have almost that exact bench that is really weathered as well. I bought yellow paint and can’t wait to follow your creative idea. Thanks for sharing!!! So sunny and fresh! pretty! LOVE your bench idea! 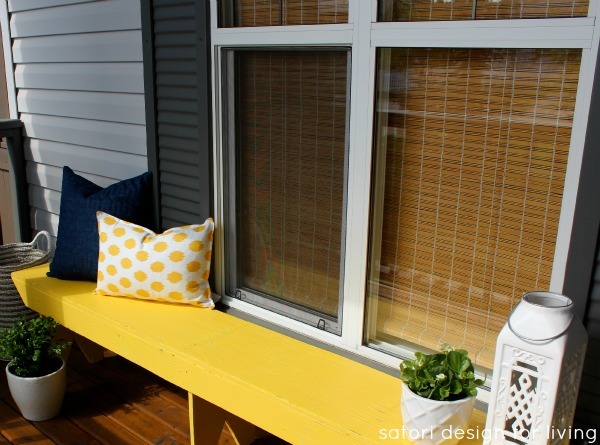 The yellow is such an inviting color on your porch. Great WELCOMING vignette!